There have been massive increases in the prevalence of opioid abuse and overdose. Everyday, it is calculated that an average 115 Americans lose their lives to opioid overdose[14,20]. The current administration has addressed the opioid epidemic, but their approach has leaned towards criminal prosecution rather than medical treatment. One of their proposed solutions, SITSA (Stop the Importation and Trafficking of Synthetic Analogues Act), is a bill that will create a new category of banned substances, essentially broadening the consequences of opioid misuse. While this bill is still being deliberated, it perpetuates a troubling trend: institutionalizing those with addiction rather than providing them the help they need. If we want to stop this opioid crisis and prevent similar ones from occuring in the future, it is time we change the stigma around drug addiction and view it as a disease rather than a moral failing. It is not the fault of those with opioid addiction. The biological effects of drugs make it very easy for regular citizens to become hooked and virtually impossible for them to stop. Additionally, certain medical practices and laws have made patients more susceptible to falling prey to opioids. How we treat those with addiction is impeding our ability to create change, and more and more patients are becoming too embarrassed to even seek treatment. Rather than considering opioid abuse a criminal offense, we need to begin treating addiction as a disease in order to reduce the stigma surrounding drug abuse and, consequently, better combat the devastating opioid epidemic. The word “opioid” is a blanket term for all opiate-containing drugs, including morphine, heroin, fentanyl and oxycodone. Opioids are structurally similar to endorphins, which are naturally produced hormones that have an analgesic effect on the body. Because of this, opioids can bind to endorphin receptors and trigger euphoria and pain relief. Simultaneously, opioids flood the brain with the neurotransmitter dopamine. Such an overstimulation of dopamine in the nucleus accumbens (often called the “reward circuit” of the brain) causes intense, pleasurable highs. With continued opioid use, the brain adjusts so that it can handle the flow of excess dopamine. To keep dopamine levels within a normal range, the brain begins to naturally produce less of it. The brain also reduces the ability of the midbrain to regulate dopamine. The midbrain contains an area called the Periaqueductal Grey, which is associated with suppressing pain. 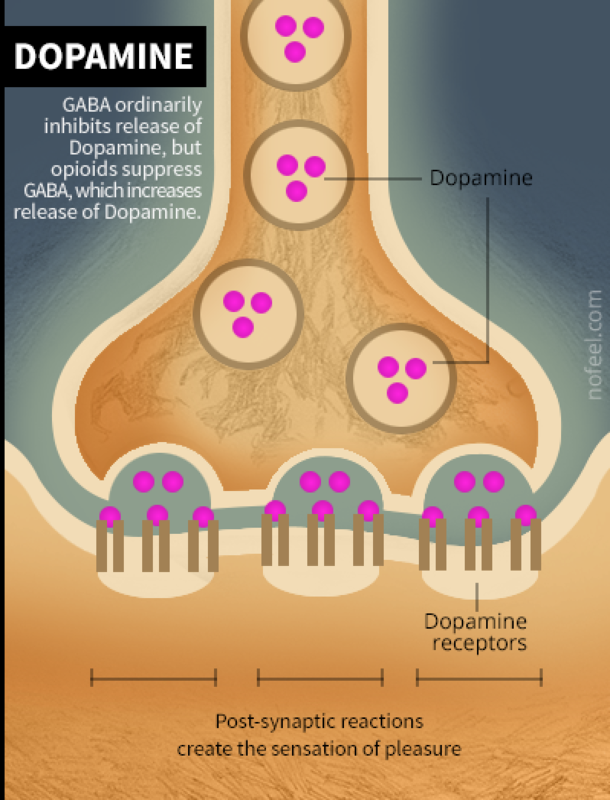 This area contains GABA neurons, which are responsible for regulating dopamine uptake. By desensitizing this area, the person will be more sensitive to pain and be more inclined to take an opioid to curb it. The opioids depress GABA activity, and the brain is flooded with dopamine, allowing it to enter the amygdala. This process ultimately triggers addiction. The user’s brain actively works to desensitize itself to the effects of the dangerously high dopamine levels, becoming less receptive to the drug with each use and creating a tolerance[6,21]. Once a user develops a degree of tolerance to the opioid, it will take a higher dosage of the drug to produce the same pain-relieving results, creating a vicious cycle that leads to even greater increases in drug use. The brain begins to associate the substances with the pleasurable highs experienced afterwards, resulting in the strong cravings we associate with addiction. Over time, the body then becomes accustomed to the presence of the substance, and will go through withdrawal symptoms if the substance is removed. This is called physical dependence, which is extremely difficult to escape. This is the final stage that most of us recognize. However, it is crucial to understand the scary and methodical process that brings someone to this point. It can simply be just one use, for something as common as a pain prescription, that spirals the situation out of control. A person can easily lose control of their own body without even knowing it. It may be surprising for some to find out that our problems with opioids originated over a century ago, around the same time as the Civil War. Opioids were prescribed in large at this time because of two main factors: many doctors were unaware of their addictive properties and there just were no other options for pain relief until the 1890s when aspirin became available. Therefore, doctors would often prescribe opioids, almost exclusively morphine, as medication to veterans and other patients. In 1898, the Bayer Company began distributing a new opioid, heroin, at a commercial scale. However, once addicts discovered that its pain killing effects could be amplified when injected, heroin became less of a “wonder drug” and more of a public health concern. As more knowledge was gained in the medical field about opioids and their addictive nature, different avenues were taken to help abate the dependence many had on opioids. One major step taken by the United States government were different legislative acts to combat the epidemic such as Pure Food and Drug Act of 1906 and the Harrison Anti-Narcotic Act of 1914. These acts allowed the government to intervene with addiction and take steps to end it, declaring heroin illegal in 1924. If we had already taken the steps to avoid it, how did another opioid epidemic erupt? This brings the story to the 1970s, when Percocet and Vicodin were being introduced into the medical field despite many doctors clearly knowing how addictive these opioids were. In 1980, a letter by Dr. Hershel Jick and Jane Porter changed everything. Based on an analysis of thousands of hospital patients given opioid painkillers, the letter argued that the risk of addiction was less than one percent. This letter was completely false science, but it was convincing enough for people in the medical community to begin accepting opioids like morphine, Vicodin, and Percocet as legitimate treatments for pain relief. The biggest one of them all, Oxycontin, was introduced in 1996. The companies that made and distributed these opioids, such as Purdue Pharma, aggressively marketed improperly researched claims stating that these drugs were not addictive. These companies would go so far as to hold events for doctors and physicians and pay for them to attend. The situation slowly spiralled out of control. Over time, opioids became more and more common, especially in hospitals. Prescription painkillers began increasing in millions every year. It continued to spiral from there; Purdue Pharma created a video depicting the positive aspects of opioids, which caused a jump of 11 million painkiller prescriptions the next year. With better technology and a more connected society, it became easier to obtain illicit opioid prescriptions, heroin, and its far more dangerous analogues. Opioids integrated itself into our health system, as quality care became tied with pain treatment. To prevent financial consequences due to low patient satisfaction ratings, physicians prescribed opioids to alleviate their pain. Within a few decades, the health care system went from demonizing opioids to worshiping them, and it became ridiculously easy for someone to get and sustain an addiction. The tragedy of the situation is that we should have anticipated the current epidemic. We had already learned the lessons of opioid abuse, but didn’t act due to greed and lack of proper oversight. It’s hard to blame anyone except the companies that made this mess and the doctors and politicians that benefited as they silently watched innocent people lose everything. Blatantly put, doctors and pharmacies should be the foundation of health care, not the epicenter of a nationwide epidemic. The “war on drugs” started in 1971, when President Richard Nixon declared drug abuse to be the United State’s number one public enemy. The polarizing war on drugs has continued to this day. The Trump administration is taking a conservative law-and-order approach to the opioid epidemic, vowing to toughen drug laws and enforce harsher punishments for offenders. The administration believes that increasing sentences and worsening punishments for drug-related offenses will deter dealers from participating in the trade and consequently will drastically reduce the overall drug supply available for purchase on the streets. This would largely decrease, if not completely eliminate, deaths by overdose. This is not a unique approach; many administrations and governments have tried it and while the idea makes sense superficially, it has disastrous consequences in reality. While one may presume that cracking down on the supply side of the problem would lead to fewer opportunities to encounter opioids, doing so does not decrease the drug’s supply — or their demand — by any means. Further criminalizing an already criminal activity does not disincentivize dealers from selling drugs or users from buying them. After all, there is always money to be made from — and addictions to be sustained by — opiates, regardless of their legal status. Studies have consistently proved that there is no statistically significant relationship between rates of drug offender imprisonment and rates of drug use. 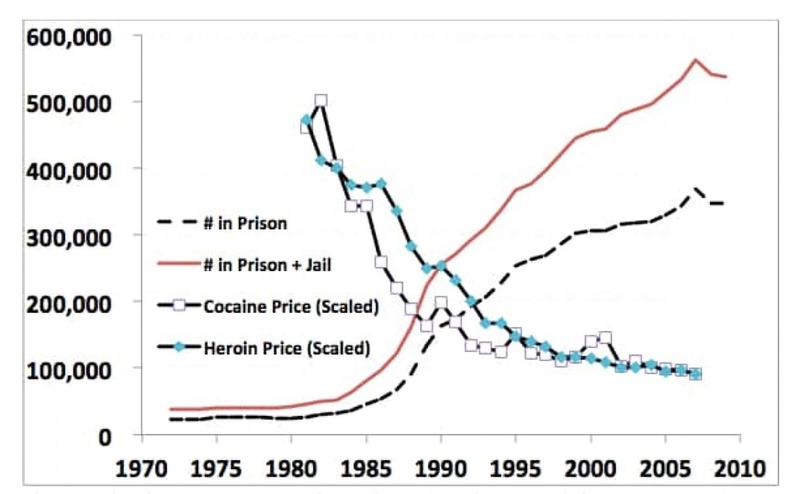 Imprisoning drug dealers only leads to increased prices in the black market for opioids, making it more profitable. Additionally, increasing the price of opiates does not diminish its demand, as dealers respond by simply adjusting the quality of their opiates (often by lacing them with inexpensive albeit equally dangerous fillers such as carfentanil) to accommodate for the inflation. Furthermore, drug production can simply be outsourced to other countries, keeping prices low but production high. This further escalates the epidemic, as normal people sometimes turn to these black market pills without knowing their contents, only to face disastrous overdoses. From an economic perspective, one can reason that as long as there is a demand for opiates, people will be in the business of supplying them. Not only does further criminalizing opioid abuse and possession fail to discourage drug dealers from pushing opiates, it is also largely ineffective at its sole purpose: addressing addiction. As addicts deal with their ongoing illness, they often face the threat of relapsing if not offered proper treatment and continual community support. Criminal charges for minor drug offenses are added stressors for those battling addiction and ultimately will do nothing to decrease the users’ physical dependence on the opiates. In fact, as will be seen later, prison charges make users more isolated from health resources and more susceptible to overdoses upon release. Criminalizing illicit drugs neither makes drugs unavailable to users nor cures their addiction. Rather, opiate criminalization merely neglects the very reason the United States is facing a public health emergency: the strength of addiction cannot be overpowered by the law. Richard A. Lawhern, founder of the Alliance for the Treatment of Intractable Pain and author for The Crime Report, writes: “If 40 years of the so-called ‘War on Drugs’ have shown us anything, it should be that counter-drug law enforcement policy and prisons do nothing to reduce addiction or promote recovery.” The war on drugs has lost sight of its intended goal of reducing drug-related deaths, instead become a war on ill individuals afflicted with addiction. This misdirection continues to endanger hundreds of thousands of lives as people continue to live with addiction and without proper treatment. Medication-assisted treatment (MAT) “is the use of medications with counseling and behavioral therapies to treat substance use disorders and prevent opioid overdose.” They provide three different types of medications, buprenorphine, methadone, and naltrexone, to ensure sufficient treatment as not all individuals react in the same way to medications. Naltrexone blocks opioid effects for about 28 days, preventing the euphoric effects of the drugs, whereas buprenorphine and methadone help keep withdrawals and cravings effects limited. These three are recognized as the “gold standard of care” for addiction due to their effectiveness in decreasing deaths caused by opioid addiction by half. It is an effective form of treatment for opioid addiction, and is particularly essential in prisons. According to Traci Green, a researcher at Brown University, prisoners are at a maximum risk of an overdose after release. Rhode Island is one state that offers MAT treatments in their prisons. After prisoners are released, they are ensured access to medication and treatments available to them. After this project was put in place, Rhode Island’s mortality rate due to overdose dropped by 60 percent. Unfortunately, as of now, Rhode Island is the only state that offers these medications. Most states do not administer medications, while some solely provide naltrexone, which is shown to be of little long-term use without therapy. This is deadly, as released inmates face a higher risk of overdose as they are more prone to be affected by stressors, such as improper or no housing, unemployment, and scattered relationships. The constant pressure of stressors can induce relapses due to cravings, needing a release, and dependence on the substance. If people aren’t given proper treatment in prison and released back to the same environments they were in before–they are more likely to regress back to similar behaviors. Furthermore, their tolerance is extremely low due to no access to drugs in prison. When they use the same amount of drugs they had before prison, their body is overwhelmed, leading to an overdose. Prisoners deserve proper health services; it is a basic human right. Unfortunately, the obstacles preventing them from accessing the necessary healthcare is ingrained in the stigma against the treatments. Naltrexone, methadone, and buprenorphine are softer forms of opioids, which have caused many to cry foul, claiming that these drugs are just replacements. However, they are ignoring the science and research behind these treatments, especially the fact that these drugs are crutches, designed to be supplemented with therapy. These drugs are the training wheels, and once the patient can ride without someone holding them, the training wheels are taken off. Unfortunately, this all comes down to how society views addiction. If addiction was viewed as a disease, everyone would feel comfortable with providing the proper medication. Instead, addiction is viewed as a bad moral choice and is looked down upon. This is clearly seen, as officials have cut down health services to conserve money for other expenses. It is tragic that after spending so much time incarcerated with no help for their ailments, their first days of freedom lead directly to an overdose. And there is nothing they can do about it. The alarming increase in opioid overdoses in recent years cannot be ignored. However, with the current mindset and stigma towards addiction leading to actions such as SITSA, it must be reiterated that approaching drug misuse as a criminal offense will not only make the situation worse, but leave the door open for similar drug epidemics to plague the country. Opioid misuse is out of a user’s control, which we have shown through biological, historical, or political factors. Understanding why this epidemic occurred, and how to treat the addiction without increasing the negative stigma surrounding it, provides the best solution to combating this epidemic. For those who know of anyone suffering through opioid addiction, please offer them time, support, and openness to their situation and their ability to change. There are several steps to treating an addiction, and patients will need a positive community along the way. The first step of treatment is for the patient to enroll in a detox center where they will receive treatment to overcome withdrawal symptoms and remove all traces of the drugs from the body. Afterwards, the patient is referred to an inpatient opioid rehabilitation. This stage of treatment offers psychological treatment to avoid future relapses by uncovering the root of their drug abuse and teaching patients how to live healthy and independent lives. Because the early stages of addiction treatment can be particularly difficult for former opioid users, counseling sessions are often implemented for emotional support. Afterwards, patients receive what is called intensive outpatient rehabilitation, where they receive medication to treat their addiction cravings, such as MAT. Again, patients are not treating drug addiction with yet another drug, these medications are clinically proven to effectively treat opioid abuse disorders. At this stage, patients typically live by themselves and have the option to work for a living. Once patients have successfully completed the treatment program, they are said to be in “aftercare”. Despite being fully functioning, independent individuals, these patients are often given the option to live in a halfway house, which is a group home that provides the network of support that former addicts may need to make the transition into productive members of society. While the aforementioned process is generally an effective method of opioid treatment, its high costs can be prohibitive for some people. Fortunately, the vast majority of addiction treatment centers accepts both private insurance and medicare. Additionally, most treatment centers receive state and federal fundings to help subsidize the costs of patient treatment so that the services can be administered to all who need them. Residents of the greater Columbus area who are struggling to afford treatment for their opioid addiction are encouraged to reach out to any of the following resources that cater to low-income patients: The Center for Balanced Living, House of Hope, Directions for Youth Alcohol and Drug Treatment Program, Columbus Public Health Alcohol and Drug Treatment Program, Ohio Addiction Recovery Center, and Volunteers of America Substance Abuse Greater Ohio. In cases of emergency that require immediate attention, call the Opiate Crisis Line: 614-724-HOPE (4673). Kosten, T.R., George, T.P. (2002, July 1). The Neurobiology of Opioid Dependence: Implications for Treatment. Science and Practice Perspectives, 1(1), 13-20.